When John was 15 years old a massive earthquake hit Yellowstone National Park. He and his parents were sleeping in this cabin when the Earthquake hit. In the morning, his father gave him their family 35mm camera loaded with slide film and told him to go take pictures. The earthquake caused a landslide blocking the river. 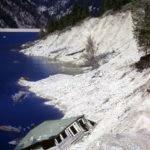 When the lake rose behind the landslide, all the cabins floated off their foundations. As the lake rose, the prevailing winds blew them east (upstream). 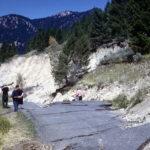 They moved about 1 1/2 miles before the lake topped the slide and began to cut a channel. When this happened, the lake dropped and the cabins settled where they were. 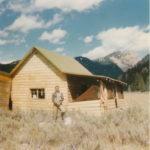 The photo of him in front of the cabin was two months after the earthquake and shows their cabin off of its foundation. The National Park Service produced a video (VHS) about the event and even lists John in the credits for some of the photos shown. When he came in to Leave A Legacy wanted to update his media so that he could share his experience with a group meeting. He brought in slides and two VHS videos. We ultimately combined the slides and the video on to a single playable DVD that he can project at his meeting and pause for as long as needed to tell his story.